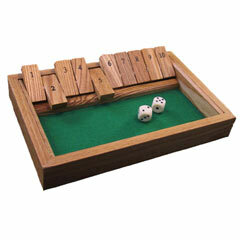 If you're looking for a family friendly game, you can't go wrong with the shut the box dice game. Mom, Dad, Grandpa and the kids can learn the simple dice game rules and enjoy playing. Better yet, the kids can practice their math skills and not even realize it! The history of shut the box indicates that the game originated in Northern France. It then grew into a popular pub game in England. The game's appeal lies in its simple instructions and the anyone-can-win game play. To win, you'll need luck to get the right numbers on the dice. The classic shut the box dice game does require a box to play. This game also be enjoyed for free with a proper score sheet for each player. The goal of the game is to close or cover all of your boxes before the other players. The game instructions are easy to follow. This dice game can also be played by a single player, but I think it is best enjoyed by 2 or more. This classic game makes a great gift for the game lover. I'd recommend the bookshelf edition, pictured below. With wooden tiles and wooden dice, the game exhibits old-fashioned charm. You can find the game on various web sites, but I like shopping at Uncle's Games. When I buy games and dice from them, the service is always efficient and I get my order within 2-3 days. I also like the personal, hand written note from the staff inside my shipment. I am one of their satisfied customers.